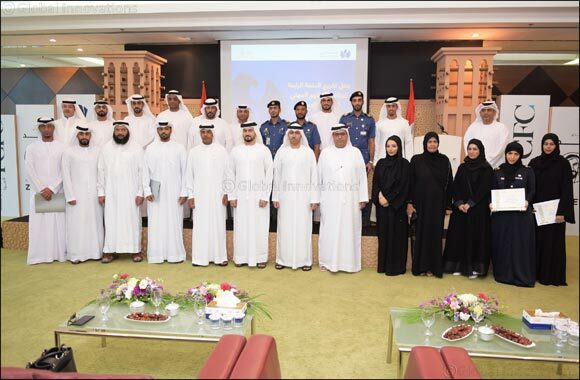 Dubai – 23 October 2018: Dubai Customs celebrated the graduation of 20 employees who make the fourth batch of customs investigation diploma which was organized in collaboration with Dubai Judicial Institute (DJI). The graduation ceremony took place in the presence of Ahmed Mahboob Musabih, Director of Dubai Customs and Dr. Jamal Hussein Al Sumaiti, Director of the 'Dubai Judicial Institute', along with a number of executive directors, heads of departments and male and female graduates. The graduates took 16 days to finish the 80-hour program. Commenting on the event, Musabih said:” We continually develop our human capital in all means in support of the national strategies and agendas. We develop the skills of our people as we believe they are our real fortune, following the wise vision of His Highness Sheikh Mohammed bin Rashid Al Maktoum, Vice President and Prime Minister and Ruler of Dubai”. He adds: “Dubai Customs follows the strategic thinking of our wise leadership in order to achieve the goals and plans towards our ambitious UAE Centennial 2071 plan. These plans will pave the road for us in the coming decades where many possibilities will unfold to help us attain higher international ranks”. The program, Musabih explained, is the fruit of a long term partnership between Dubai Customs and Dubai Judicial Institute. This has involved hard work and participation of a number of experts and specialists in customs investigation field. DJI provided the training and skill development in customs investigation field. Since 2013, three other batches of 55 employees have graduated from the customs investigation diploma program. The 4th batch saw the graduation of 20 employees, which raises the total number of graduates to 75. On his part, Dr. Jamal Hussein Al Sumaiti, Director of the 'Dubai Judicial Institute said:” Graduating the fourth batch of the customs investigation program is a good achievement for us. We train people to help provide the legal and judicial sectors with qualified national cadres in this field. I am happy to congratulate all male and female graduates”. Dr. Shaikha Al Ghafiri, (Acting) Director of Dubai Customs' Training Center pointed out the objective of this program is to develop skills in customs investigation side to maximize efficiency and boost inspectors’ performance.